This article is about the Honda minivan model. For the Honda all-terrain vehicle, see Honda Odyssey (ATV). This article is about the North American Honda Odyssey. For the Odyssey sold outside North America, see Honda Odyssey (international). 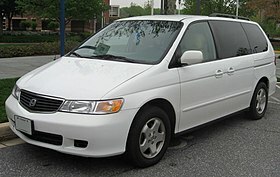 The Odyssey had originally been conceived and engineered in Japan, in the wake of the country's economic crisis of the 1990s – which in turn imposed severe constraints on the vehicle's size and overall concept, dictating the minivan's manufacture in an existing facility with minimal modification. The result was a smaller minivan, in the Compact MPV class, that was well received in the Japanese domestic market and less well received in North America. The first generation Odyssey was marketed in Europe as the Honda Shuttle. The Odyssey was introduced in 1994 as Honda's first minivan — based on the Accord platform, with a 4-cylinder engine, all-disc anti-lock braking, all wishbone suspension, and a four-speed automatic transmission with a steering-column-mounted shifter and a hill-hold feature, marketed as Grade Logic. This class of vehicles would subsequently become known as Compact MPV. The design featured unibody construction, dual airbags, dual gloveboxes, dual zone heating and cooling with 20 percent greater capacity than an Accord's system (overhead rear fan-speed adjustment control, and main control switch over the front-seat passenger), conventional rear swing-open rather than sliding doors, and a third row seat that could fold and tumble into a compartment beneath the floor — the spacesaver spare tire carried inside, on the right, rear wall of the cabin. Honda marketed the first generation Odyssey in two trim levels. The LX accommodated seven passengers with two front buckets, a removable three-seat middle bench, and a 2-seat third row bench. The EX accommodated six passengers (using two removable second row captain's chairs in lieu of the bench) and offered additional equipment including a roof rack, alloy wheels, power driver's seat height adjustment, power sunroof, remote keyless entry system, fog lights (later model years), body-colored side moldings and mirrors, map lights, and 20-watt AM/FM/cassette six-speaker audio system. Isuzu offered a rebadged version of the Odyssey from 1996–1999 as the Isuzu Oasis. The Odyssey was engineered by Kunimichi Odagaki, then a chief engineer at the Honda's Research and Development Center, along with a team of 20 members — in the wake of Japan’s recession of the early 1990s and the possibility of a 25-percent tariffs if the minivans were imported to the U.S. as light trucks. In the course of developing the Odyssey, it became paramount to circumvent these obstacles and conceive a feasible interior package that could use existing manufacturing facilities with minimal investment. Odagaki continued working with an "underground" team, using as its design credo the concept of a "personal jet" — which in turn led to the car's original PJ concept code-name. Odagaki conceived the idea of the third row seat folding into a floor compartment, and he worked with his team to include a "center aisle." The team determined a minimum interior height of 1.2 meters to retain the aisle, and favored a design with a low floor — to provide ease of passenger entry and exit, easy garage-ability, low roof-loading height, as well as enhanced productivity on the assembly line. The team worked to convince management of the project's viability, using extensive illustrations, a one-quarter scale model and a full-size foam model. By April 1991, Odagaki won permission to develop a prototype. After bringing the right-hand drive prototype to the U.S., Odagaki won the support of American Honda. Production was officially launched on October 20, 1994 — the first Honda model in to be released at the same time through Honda's three Japanese distribution channels (Primo, Clio, Verno), marketing the Odyssey through the three channels under the same name. At its debut, the Odyssey won the Japan Car of the Year Award (Special Category) and the RJC New Car of the Year Award. By September 1997, the Odyssey had sold more than 300,000 units, becoming Honda’s fastest-selling new car and breaking the Civic’s record. The second generation North American market Odyssey was first assembled in Canada as a 1999 model mainly for North America between 1998 and 2004 — and exported to Japan as the LaGreat between 1999 and 2004. The television ad campaign for the new Odyssey evoked moments from the film 2001: A Space Odyssey, particularly the extended space-station docking and lunar landing sequences to the soundtrack of The Blue Danube waltz. By its second generation, the Odyssey was considerably larger than its predecessor, and adopted the Chrysler style minivan format, with sliding rear doors instead of hinged ones, simpler front strut suspension in place of upper and lower control arm front suspension of the 1995-1998 model and a 210 hp (157 kW) V6 engine instead of the original, four-cylinder. The Odyssey offered two sliding doors as standard equipment, whereas some minivans of the time only offered one, a second door being optional. The Odyssey offered power sliding doors which were standard on the EX trims, but not available on the LX trims. The Odyssey kept the fold-into-the-floor rear seat, an innovation adopted by many other minivans. The van continued to receive upgrades, such as offering both VHS and DVD-based entertainment systems. There was also an available Honda Satellite-Linked Navigation System, introduced during 1999, which became the first navigation system ever offered in a minivan. The 2004 model was the only second generation Odyssey model year to receive reliability ratings of five out of five according to Automotive Information Systems. IIHS gave the Odyssey a Good rating in the Frontal Offset Test in years 1999-2004. The second generation was praised for its powerful V6, its handling from its four-wheel independent suspension, and its features such as a large cabin, power sliding doors (manual sliding doors on LX models) and the stow-away third-row seat. Some[who?] found it noisier than competitors. It won consecutive Edmunds.com Editors' Most Wanted awards from 1999–2003 in the minivan category. This is also the only generation of the Honda Odyssey where the power windows are only on the driver's and front passenger's doors. The Odyssey also received a significant increase in power from 210 hp (157 kW) to 240 hp (179 kW) during 2001. Also added was a five-speed automatic transmission, side torso airbags (not side curtain airbags), rear disc brakes, and a few minor cosmetic improvements on the outside as well as the inside. Other than an AUTO power driver's window, the Odyssey remained unchanged for 2003 and 2004, before being replaced with the third-generation model. The 4-speed automatic transmission in 1999 to 2001 models had serious problems with transmission durability. Honda spokesman Mike Spencer stated that four-speed models were afflicted with a bad bearing that could break apart, scattering fragments of metal that clogged fluid passageways in the transmission, causing it to shift erratically. Honda responded to the problems by extending the warranty on the transmission on American 1999-2001 models to 7 years or 100,000 miles (160,900 km). A class action settlement further extended coverage to 109,000 miles (175,400 km) or 93 months for some 1999-2001 Odysseys in the US. Canada is not included. The five-speed automatic was first installed in the Odyssey for the 2002 model, but general reliability of the 1999-2003 transmission was poor according to Consumer Reports. Mike Spencer, a spokesman for Honda, said that the five-speed models typically were damaged by premature wear of the third-gear clutch pack. As the clutch friction material abraded, it scattered bits inside the transmission case, clogging fluid lines and causing erratic shifting. Drivers might suffer slipping, poor or no shifts, or sudden down-shifts from 5th gear to 2nd gear. Under some conditions, a different 5-speed transmission problem arose. Second gear could overheat and break, causing the transmission to lock. An oil jet was added to lubricate this gear but this did not solve the third gear clutch problem. The addition of the Honda transmission cooler with the towing package still allows transmission fluid temperatures that are too high. But it was required along with a power steering cooler for any towing, or the warranty would be void. The Acura CL, TL, MDX and Honda Accord suffered similar problems. Honda introduced the ACE body engineering to the third-generation Odyssey, which was later used on the eighth generation Civic. Side-curtain airbags and electronic stability control are included in all models. Both features were previously unavailable. Additional features included integrated sunshades in the rear doors, windows that roll down in the second row, and the third row 'Magic Seat' was changed from a straight bench design to a split 60/40 design to allow for variable folding. The headrests could now be left in place when tumbling the rear seat. Some notable features of the redesign were dual glove boxes and an in-floor lazy susan storage compartment, located in the previous generation's spare tire well. Third generation models offered a dashboard-mounted shifter, instead of a column-mounted shifter. The second row bucket seats do not fold into the floor. A 'Plus-One' jump seat was standard on EX and EX-L trims for use with an eighth passenger. Touring models came with a center storage compartment. Engine power was increased to 255 hp (190 kW) (re-rated to 244 hp (182 kW) by the new SAE J1349 guidelines, and used in 2006+ model descriptions) and EX-L and Touring models received Honda's VCM, or Variable Cylinder Management system. This enabled this van to receive U.S. Environmental Protection Agency (EPA) fuel economy ratings of 20 mpg‑US (12 L/100 km; 24 mpg‑imp)/28 mpg‑US (8.4 L/100 km; 34 mpg‑imp) for the 2005 model year. (19 mpg‑US (12 L/100 km; 23 mpg‑imp)/25 mpg‑US (9.4 L/100 km; 30 mpg‑imp) for non VCM equipped LX and EX models. )< These numbers were re-rated in 2007, bringing numbers to 17/25 for VCM equipped models, and 16/23 for non VCM equipped models. Acceleration was slightly slower than generation two models. It was rated top pick in minivan category in Consumer Reports 2005 Annual auto issue. The EX-L and higher trims could be purchased with both navigation and rear entertainment systems, or rear entertainment system only, while the VHS-based i-VES system was dropped. Four trim levels were available in the United States: LX, EX, EX-L, and Touring, the top-of-the-line package in the Odyssey lineup that incorporated features such as run-flat tires, power tailgate, power adjustable pedals, multi information display, memory seats and chrome tailgate trim. Problem areas included body integrity, which includes paint wear and rusting, body hardware bumpers being loose, audio system, brakes and suspension according to the Consumer Reports issue of April 2006. According to the online edition of Consumer Reports in June 2016, transmission problems were better than average for 2006 models. Crash test ratings have been five star in every test but the 2005 had a safety concern. "During the side impact test, the driver door became unlatched and opened. A door opening during a side impact crash increases the likelihood of occupant ejection." Odyssey has won a spot on Car and Driver's 5 Best trucks for the past three years, as well as a host of other awards. The Odyssey is the top-ranked minivan in the US News charts. The 2007-09 Odyssey was the best-selling minivan in the United States. For 2008, the Odyssey received a mid-model facelift. All models were equipped with active front head restraints, daytime running lights, redesigned dashboard, grille and taillights. An audio AUX jack became standard equipment. The backup camera, previously only included with navigation-equipped models, was integrated into the rear-view mirror of the non-navigation EX-L. Touring models featured full Bluetooth support for all Bluetooth-equipped devices, and are now standard with navigation. EX, EX-L, and Touring models came standard with the updated 'Plus One' jump seat with added storage features. In Canada, an entry-level DX trim was added to the LX, EX, EX-L, and Touring packages for the 2008-2010 model years. The DX lacks features such as the "2nd-Row Plus One Seat with storage", conversation mirror with sunglasses holder, tinted glass, roof rails, and has black body moldings. The LX trim level was dropped for the 2010 model year, which also saw a SE Odyssey NHL edition replace the EX (being identical to the 2008-09 EX in all respects but with a rear entertainment system and NHL badges). For the 2010 model year, the DVD rear entertainment system is now available on the EX-L trim and while it is still standard on the Touring. Honda presented the 2011 Odyssey Concept in early 2010 at the Chicago Auto Show and officially on June 17; with a larger, wider body, a lower roofline and revised styling. A Touring Elite model became available. Compared to its predecessor, the fourth generation Honda Odyssey is 0.8 in (20 mm) longer, 2.1 in (53 mm) wider and 0.4 in (10 mm) - 0.6 in (15 mm) lower. The body is constructed using 59% high strength steel, ranging from 390-1,500 MPa yield strength. Available trim levels initially included the LX, EX, EX-L, Touring and Touring Elite. The fourth generation Odyssey introduced options including 12-speaker 650 watt audio system (Touring Elite), a voice-controlled satellite GPS and HDD navigation system with XM NavTraffic (Touring and above, available EX-L), an external HDMI input (Touring Elite), a larger 16.2 in (410 mm) split-screen rear-seat DVD entertainment system (Touring Elite), a "cool box" chilled by the air conditioning (EX-L and above), a stowable 3rd row 60/40 split bench seat, a removable first row center console (EX and above), and a new steering wheel via updates. The fourth generation Odyssey includes projector headlamps or HID xenon low-beam headlamps (Touring Elite), standard 17-inch wheels, 18-inch alloy wheels (Touring and above), and 6-speed automatic transmission (Touring and above). A Blind Spot Display for the driver's side and a multi-angle backup camera is available. For the 2014 model year, Honda facelifted the Odyssey. Changes included a 6-speed automatic transmission on all trims, sleeker exterior styling with a new aluminum hood, aluminum front fenders, twin-bar grille and revised lower front fascia with optional integrated fog lights, darker-finish projector headlight housings, Smart entry availability and LED rear taillight bars. A built-in vacuum cleaner system is included with the Touring Elite model. Honda's i-MID, also available on the Civic and Accord, became standard equipment in 2014 models; all models now got standard Pandora Internet Radio capabilities, Bluetooth Hands-Free Link, iPod, iPhone, and USB integration, and a color display screen. New safety features included in the refresh include a LaneWatch camera housed in the passenger side-view mirror which may be paired with the driver's side Blind Spot Display system. Forward Collision Warning (FCW) and Lane Departure Warning (LDW) are also available while a single-angle backup camera with dynamic guidelines became standard equipment. The models for 2014 include the LX, the EX, the EX w/ Leather (EX-L), the Touring, and the Touring Elite. The SE trim positioned between EX and EX-L, was initially limited to the Canadian market but is available in the US as of the 2016 model year. New exterior paint colors were made available in 2014, as are new interior fabrics and trim pieces. The Insurance Institute for Highway Safety (IIHS) found the Odyssey to have the lowest overall driver death rate in its class with 0 deaths per million registered years. Beginning with the 2013 model year all Odysseys came equipped with a rear-view backup camera. For 2014 the front crash structure was upgraded. The fifth generation Odyssey was unveiled at the 2017 North American International Auto Show in January. Sales began on May 25, 2017 as a 2018 model. A 10-speed automatic (Touring and Elite trim levels) produced at Honda Precision Parts Georgia (HPPG) is Honda's first use of a 10-speed transmission in a production automobile. Honda Manufacturing of Alabama (HMA) kicked off production of the fifth generation Odyssey on April 26, 2017. Compared to its predecessor, the fifth generation Honda Odyssey is 0.3 in (8 mm) longer, 0.7 in (18 mm) narrower, 1.2 in (30 mm) taller and share the same 118.1 in (3 m) wheelbase. The body is constructed using ultra-high-strength steel, aluminum and magnesium that minimizes weight to up to 75 lb (34 kg) and improves torsional body rigidity up to 44% from the previous generation. Available trim levels follow the outgoing model in the LX, EX, EX-L, Touring, and Touring Elite trims. The 2018 Honda Odyssey received a second Top Safety Pick+ award by the IIHS. At its debut, the Odyssey won the Japan Car of the Year Award (Special Category) and the RJC New Car of the Year Award. By September 1997, the Odyssey had sold more than 300,000 units, becoming Honda’s fastest-selling new car and breaking the Civic’s record. The Odyssey was Wheels magazine's Car of the Year for 1995. At the Odyssey's European launch, where it was marketed as the Shuttle, British ex-Grand Prix driver Jonathan Palmer described its handling as equal of any "executive sedan". The Odyssey has received numerous awards since its inception, winning both Car and Driver's "5 Best Trucks" and Consumer Reports' "Top Pick Minivan" several times. In the middle of 2012, Honda began exporting the new Odyssey minivan to the Philippines. Export of the Odyssey to that market ceased in 2015 after the introduction of the international fifth-generation Odyssey which is imported from Japan. A version of the second generation North American Odyssey was sold in Japan as the LaGreat. The Odyssey manufactured at HMA in Alabama has also been exported to Canada, Mexico, South Korea, Qatar, Oman, Saudi Arabia, and the United Arab Emirates. ^ a b c d e f g h i j k l m "Developing a Car with a Roomy Interior". Honda Worldwide. ^ a b c Anderson, Greg (January 1, 1999). "First Drive: 1999 Honda Odyssey". Insideline. ^ a b c Karr, Jeff (March 1995). "Honda Odyssey EX V S Nissan Quest GXE - Road Test". Motor Trend. ^ a b c Bartlet, Jeff (February 1995). "1995 Honda Odyssey - Long Term Wrapup". Motor Trend. ^ a b Crouch, Jonathan. "Honda Shuttle (1995 - 2000)". Yahoo Cars, UK. ^ Stout, David (1996-05-03). "A More Varied Diet for a Cab-Hungry City". The New York Times. Retrieved 2010-05-04. ^ Perez-Pena, Richard (1995-11-05). "A Cab That's a Van!' and Other Reactions to a Test Drive". The New York Times. Retrieved 2010-05-04. ^ "Honda Canada | Honda in Canada | Honda Canada Milestones - 1990-1999". Honda Canada. Retrieved 2017-12-13. ^ "Honda Worldwide | Products & Technology | Automobiles | History". World.honda.com. Archived from the original on 2009-09-03. Retrieved 2009-05-10. ^ a b "Honda Odyssey Vehicle Details". IIHS. ^ a b "Honda Odyssey Minivan". Edmunds.com. Retrieved 2010-02-12. ^ a b O'dell, John (2002-09-11). "Honda's Unexpected Gear Shift". The L.A. Times. Retrieved 2010-05-04. ^ "Odyssey Transmission Recall" (PDF). Archived from the original (PDF) on 2010-03-31. Retrieved 2010-10-09. ^ "OdyClub Forums - "Does Plus one seat fit touring?"". Odyclub.com. 2007-11-26. Retrieved 2010-10-09. ^ "2005 Honda Odyssey model library". Automobiles.honda.com. Retrieved 2010-10-09. ^ "2008 Honda Odyssey model library". Automobiles.honda.com. Retrieved 2010-10-09. ^ "NHTSA - 2005 Honda Odyssey w/SAB". Archived from the original on 2008-02-19. ^ "2010 Honda Odyssey Reviews, Pictures and Prices". U.S. News Rankings and Reviews. Retrieved 2010-02-12. ^ Jensen, Cheryl (2010-10-29). "Honda Odyssey Is the Latest Weapon in the Battle of the Vans - Review". The New York Times. ^ "The all-new 2011 Honda Odyssey Brochure". Honda. ^ "Honda reveals 2011 Odyssey minivan". Leftlanenews.com. 2010-08-11. Retrieved 2010-09-12. ^ "2011 Honda Odyssey Promises "More Swagger"". Jalopnik.com. 2010-06-18. Retrieved 2010-09-12. ^ "Improved vehicle designs bring down death rates". IIHS. ^ "Driver death rates by make and model". IIHS. ^ "2013 Honda Odyssey: What's Changed". Cars.com. ^ "Honda Odyssey is first minivan to earn the IIHS TOP SAFETY PICK+ award". IIHS. ^ "2011 Honda Odyssey VAN FWD". Safercar.gov. ^ "2018 Honda Odyssey Production Begins". Retrieved 2017-10-03. ^ "2018 Honda Odyssey Press Kit - Overview". Honda Newsroom. Retrieved 2017-10-03. ^ "Quality and Reliability Make Honda Odyssey Award-Winning Minivan". Honda.com. 2003-10-06. Retrieved 2010-02-12. ^ "Honda Division Breaks Annual Auto Sales Record as Honda and Acura Brands Set Numerous New Sales Marks". Honda. ^ "American Honda Sets New All-Time Annual Sales Record". Honda. ^ a b "American Honda Sets 3rd Straight Annual Sales Record with Best-Ever December for Trucks". Honda Newsroom. Retrieved 2018-02-04. 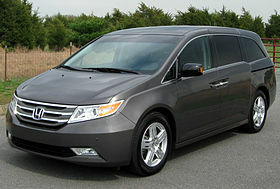 Wikimedia Commons has media related to Honda Odyssey (North America). This page was last edited on 4 April 2019, at 19:10 (UTC).